So why do the earliest guitars to be sold have a headstock which looks like this? For decades people have wondered what happened to the silk screen, now we know! Click the link to my site below to find out why! I think that's very interesting. Glad to see the actual change order on your website. 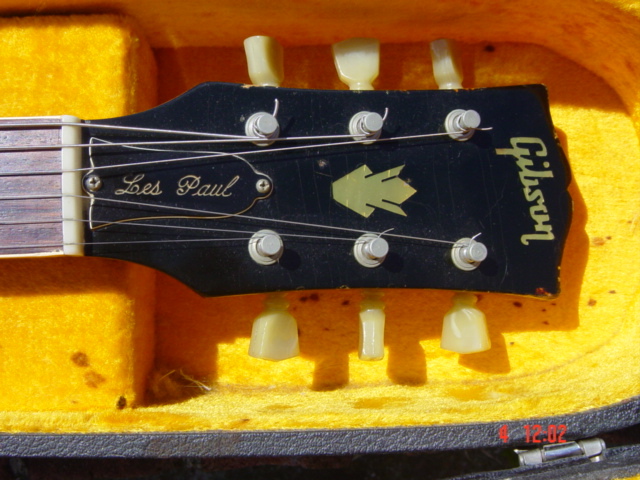 So it sounds like they removed the Les Paul signature silk screen from the headstock when Gibson stopped production of the original Les Paul approved guitar, went to the crown inlay during the SG/LP era (1961), forgot to change the spec sheet when they restarted production of the original LP body style (1968), and then caught their mistake after a few squeaked through production. Very interesting how little things make something so rare. I have the same headstock on my 53 LP that was re-necked in 1962 at the Gibson factory. The crown inlay on the 68 is centered a bit more between the logo and the TRC though. Here's my 53 LP with a 62 neck/headstock. The inlay sits closer to the Gibson logo than the 68. That's some awesome minutia! Thanks for posting these posts. The "material list" is called a BOM (Bill of Materials) and every guitar has a long list of items in their "BOM". It's awesome to see the official change order and I would like to know who the person who posted it came to posess it. On another note, we would have BOM meetings for every new model and the guys in the purchasing department and engineering department would amaze me with their knowledge of evey part # and could spot a mistake in seconds. Sometimes, things get past everybody, as this particular case in point. Stupid question: did the '68 LP's have the smaller 1 5/8" nut width like the 335's? I had a '68 335 in 1977 and was too ignorant to know about different nut widths, didn't know what was going on but it just felt smaller than all the other guitars I'd played. Stupid question: did the '68 LP's have the smaller 1 5/8" nut width like the 335's? No, Les Pauls never had this type of thinner nut. thanks so much for your website, i have referred to it often as there is alot of great knowledge there, i have posted some of your pics here at MLP when the discussion calls for a picture which usually will help someone identify certain things, hope that was ok with you, let me know if not. No prob! Just please let people know where you found the image. I watermark most of the images to help direct people to the site too. NOT for monetary purposes of course, you'll notice there are no ads on there. I've probably spent $1500 hosting the site over ten years. Oh, and thank you very much for the kind words. Semi-crappy weekend for me, so it was a nice pick-me-up. Thank you! I was very lucky to have that document cross my path! So cool! I think Gibson should've kept this headstock design since they reissued the LP back in 68, looks way cool IMO. Beside the crown inlay, it's not much different from an R6. Saw these earlier today, much better than the recent reissue with the too-heavy relic job. Next can you post the document that shows Gibson ordering construction of a really superb innovative new instrument but which by mistake ended up with the Firebird-X? An old guitar buddy of mine had a 1968 ES 335 with many signs pointing that it was from a later run in 1969 or 1970 (as I recall). This was a pride and joy guitar for him (still is) and he took the liberty to contact Gibson and inquire. Gibson explained in a letter that his guitar was made later, and had a headstock from an SG 1968 to basically have a trade show wall hanger that eventually got sold to a local dealer. They also explained that they had a run of necks that exceeded their needs, and it was a matter of resource management. I work in manufacturing. Often times with labor, a sub assembly item, in this case a neck, will be made in advance, allowing the eventual serial number to be applied when the (guitar) is completed. If it were the case that they had a lot of ‘crown’ necks, it might have served a purpose to use them up to save on resources. Back then, I would venture to guess that nobody considered that people like us would even care or notice. As for the ‘reason for change’ depicted in the BOM, that was probably written by an engineer. My experience with engineers is that they are very dry people, and explain their BOM changes to reflect the ‘need’ rather than the reason. and I think that your assessment has some merits, but weren't the necks stamped when they were made, not when they were assembled with the body? I don't guess you have a copy/shot of the letter from Gibson stating that?